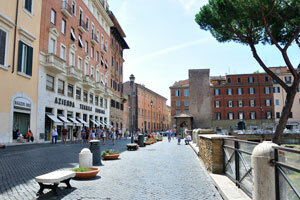 Old Rome is the historic Renaissance centre of Rome. 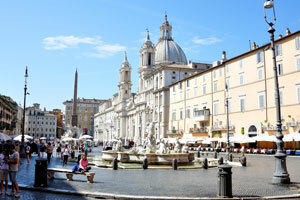 While the oldest section of Rome is at the Forum, and the Modern Center has shifted to via Veneto, Old Rome remains the city's most charming district, with lovely piazze (squares) and streets to wander and find small cafes and restaurants. 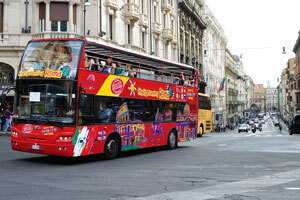 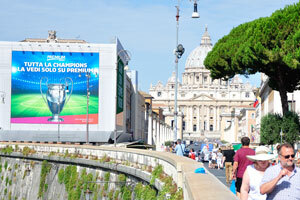 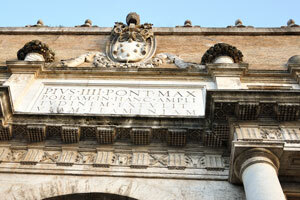 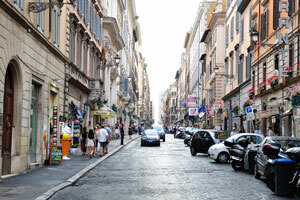 Old Rome includes the areas around piazza Navona, Campo de' Fiori, the Pantheon and the Ghetto. 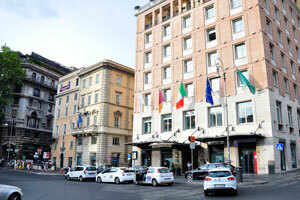 Boscolo Exedra Roma Hotel 5*. 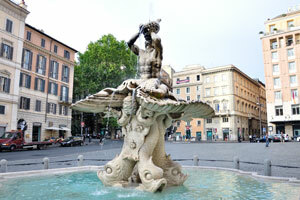 The Fountain of the Naiads is located on Piazza della Repubblica. 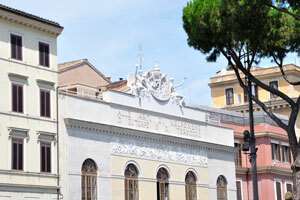 Octagonal Hall served as a planetarium in the 1920s. 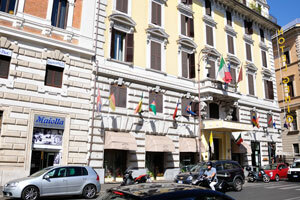 The facade of Le Grand Hotel. 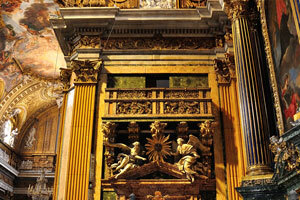 Baroque facade of Santa Susanna by Carlo Maderno. 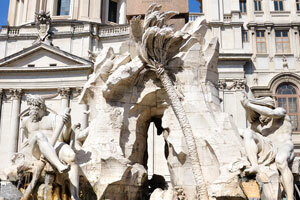 Fontana dell'Acqua Felice and the statue of Moses. 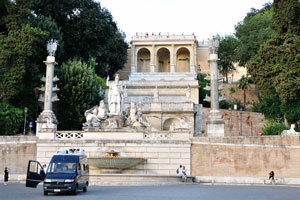 An art sculpture “Janus in The Heart of Rome” by Pietro Consagra (4 October 1997) is found in Largo Santa Susanna. 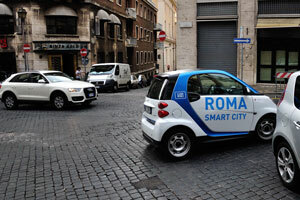 Wherever you are, you'll find a car2go close by. 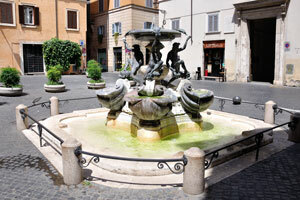 Fontana del Tritone by Gian Lorenzo Bernini in Piazza Barberini. 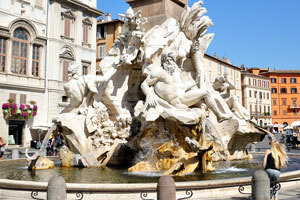 The Triton Fountain is a seventeenth century fountain. 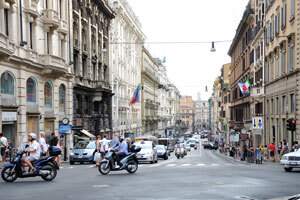 The street of Via del Tritone as seen from Piazza Barberini. 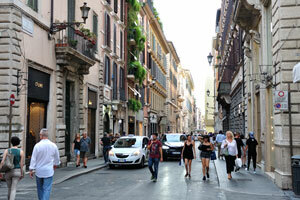 The street of Via del Tritone. 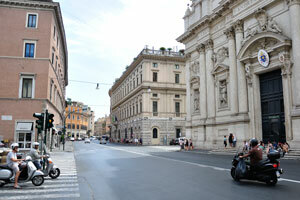 The street of Via Sistina. 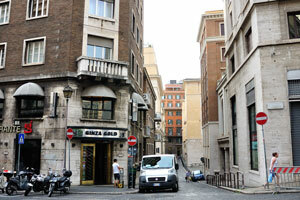 This part of the Via del Tritone street is in the area of the Stendhal hotel. 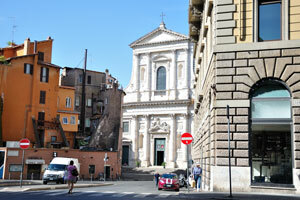 Santi Vincenzo e Anastasio a Trevi is a Baroque church. 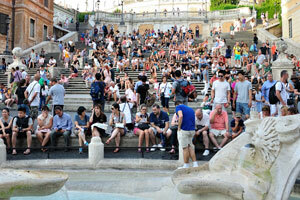 Tourists are walking near the Trevi Fountain. 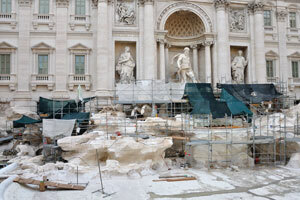 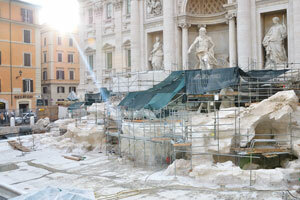 In July 2015 the Trevi Fountain was under restoration work. 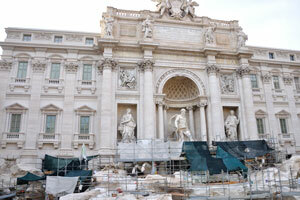 The Trevi Fountain is one of the most famous fountains in the world. 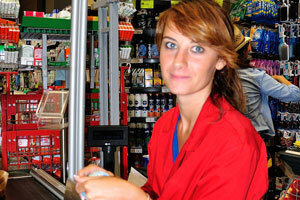 A female cashier smiles at me at the checkout of a supermarket. 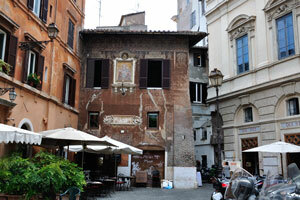 Antica Roma ice cream shop. 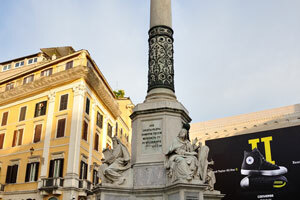 Column of the Immaculate Conception by Giuseppe Obici. 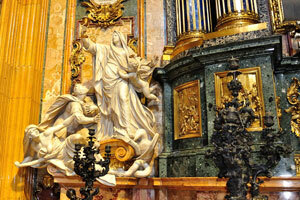 The Column of the Immaculate Conception is a nineteenth-century monument depicting the Blessed Virgin Mary. 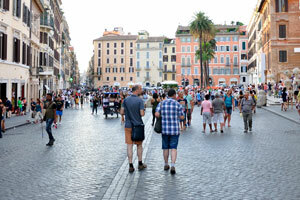 Piazza di Spagna is one of the most famous squares in Rome. 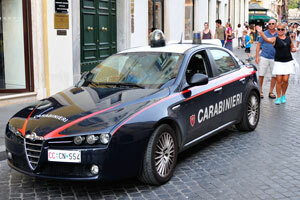 Carabinieri Alfa Romeo 159 “CC CN 554” is on Piazza di Spagna. 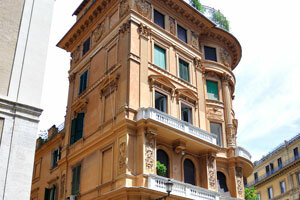 Piazza di Spagna is located at the foot of the Spanish Steps. 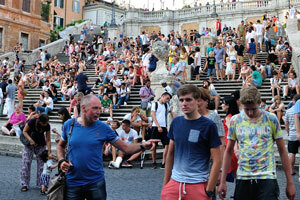 Spanish Steps is full of the strolling tourists. 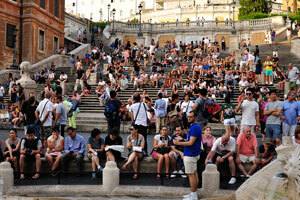 The Spanish Steps and the Fountain of the Ugly Boat which is located in foreground. 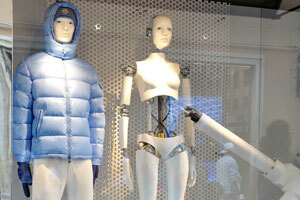 The Moncler robot mannequin by La Rosa. 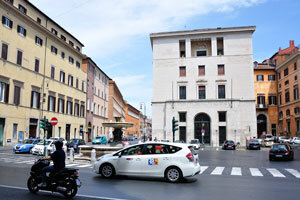 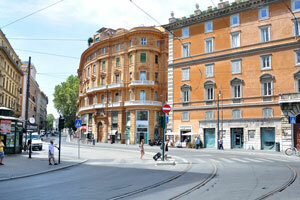 This intersection is between the streets of Via dei Condotti and Via Bocca di Leone. 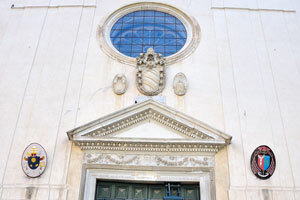 The facade of Santissima Trinita a Via Condotti. 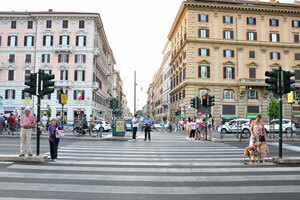 This intersection is between the streets of Via dei Condotti and Via del Corso. 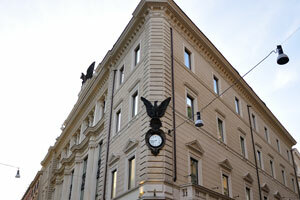 H&M shop is located inside this building adorned with an eagle. 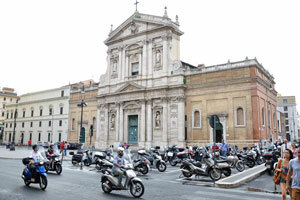 San Carlo al Corso is a basilica church. 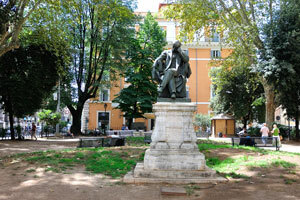 Il Babuino “The Baboon” is one of the Talking Statues of Rome. 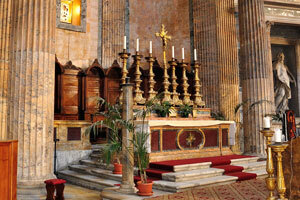 The church of Santa Maria dei Miracoli. 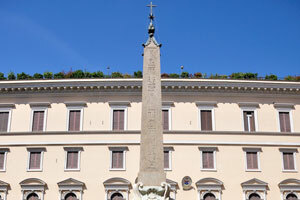 The Flaminio Obelisk is one of the thirteen ancient obelisks in Rome. 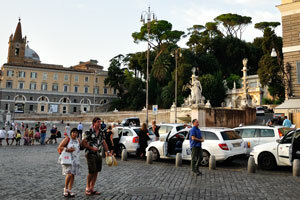 The Taxi stand is on Piazza del Popolo. 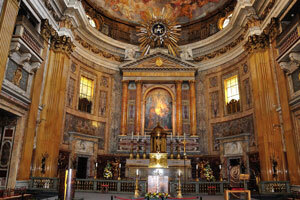 The church of Santa Maria in Montesanto. 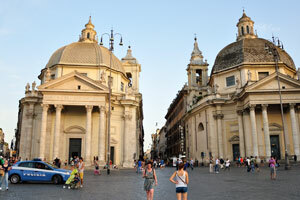 The “twin” churches of Santa Maria di Montesanto (left) and Santa Maria dei Miracoli (right). 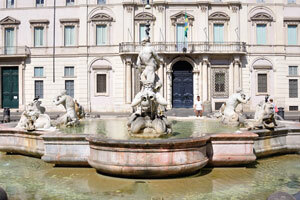 The Fontana del Nettuno “Fountain of Neptune” is a monumental fountain located in Piazza del Popolo. 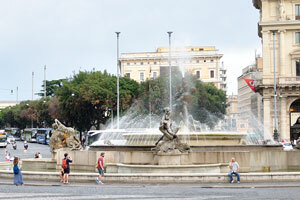 The Fontana della Dea di Roma is a monumental fountain located in Piazza del Popolo. 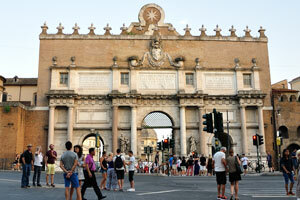 Porta del Popolo is a gate of the Aurelian Walls in Rome. 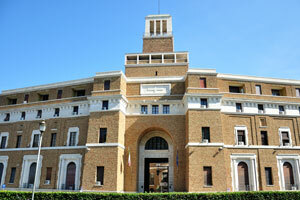 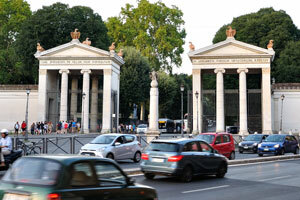 The monumental entrance is on the square of Flaminio . 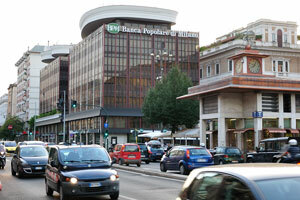 Banca Popolare di Milano is an Italian cooperative bank based in Milan. 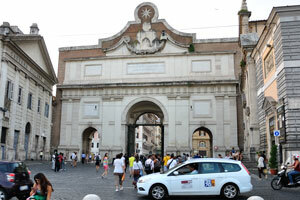 The outer facade of Porta del Popolo. 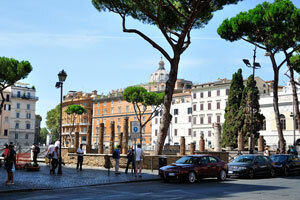 Piazzale Flaminio is a square in Rome just outside the Aurelian Walls. 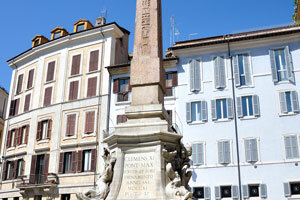 An Egyptian obelisk of Ramesses II from Heliopolis stands in the centre of Piazza del Popolo. 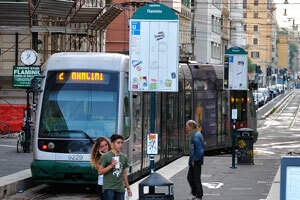 The light rail station of Flaminio. 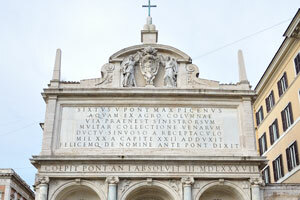 The outer facade of Porta del Popolo was commissioned by Pope Pius IV to Michelangelo. 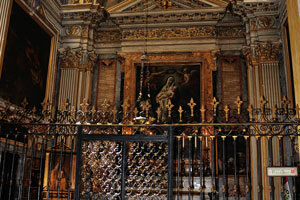 St John of the Florentines is a minor basilica and a titular church. 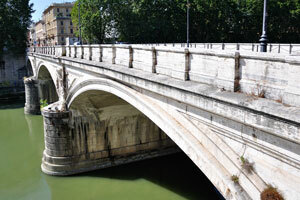 The bridge of Ponte Vittorio Emanuele II. 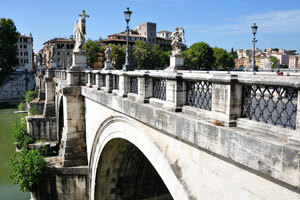 Ponte Vittorio Emanuele II is a bridge constructed in 1886. 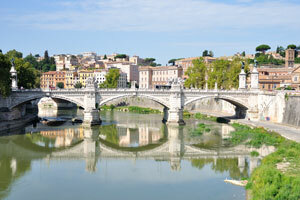 Ponte Vittorio Emanuele II is a bridge constructed by the architect Ennio De Rossi. 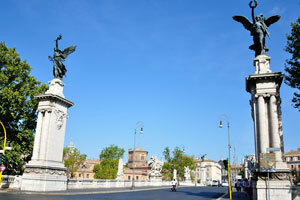 The bridge of Ponte Vittorio Emanuele II connects the historic centre of Rome with the rione Borgo and the Vatican City. 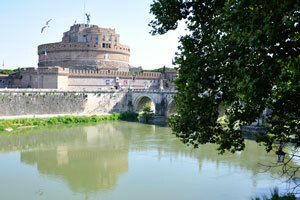 The Mausoleum of Hadrian as seen from the bridge of Ponte Vittorio Emanuele II. 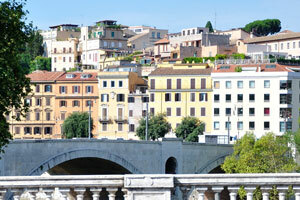 The bridge of Ponte Principe Amedeo Savoia Aosta as seen from the bridge of Ponte Vittorio Emanuele II. 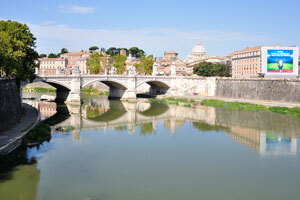 The bridge of Ponte Vittorio Emanuele II crosses the Tiber river. 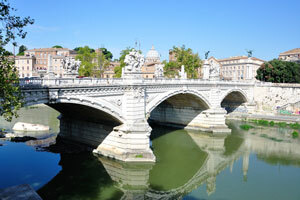 The bridge of Ponte Sant'Angelo. 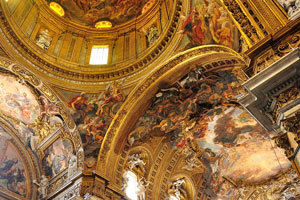 The church of San Giovanni dei Fiorentini. 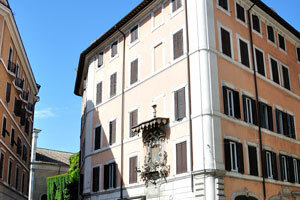 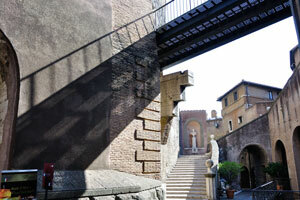 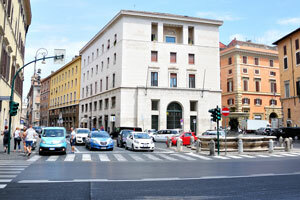 This intersection is between the streets of Lungotevere Tor di Nona and Via del Banco di Santo Spirito. 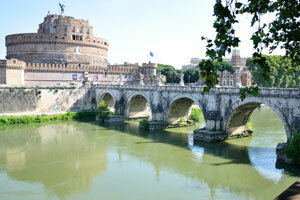 Ponte Sant'Angelo spans the Tiber from the city center to the Mausoleum of Hadrian. 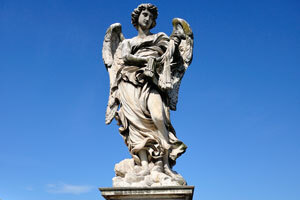 Angel with the Whips by Lazzaro Morelli is on the bridge of Ponte Sant'Angelo. 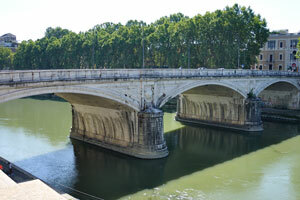 The bridge of Ponte Vittorio Emanuele II as seen from the bridge of Ponte Sant'Angelo. 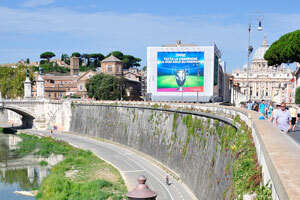 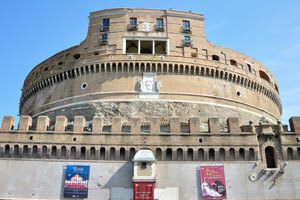 The Mausoleum of Hadrian is a towering cylindrical building in Parco Adriano. 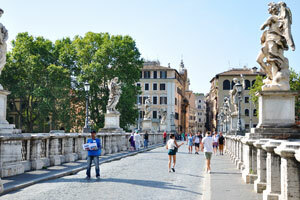 Tourists are on the Ponte Sant'Angelo bridge. 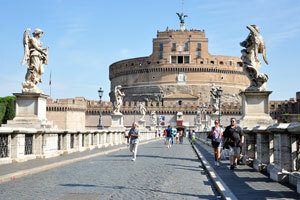 The bridge of Ponte Sant'Angelo is now solely pedestrian. 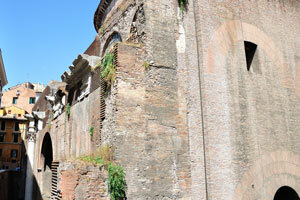 We are inside the Mausoleum of Hadrian. 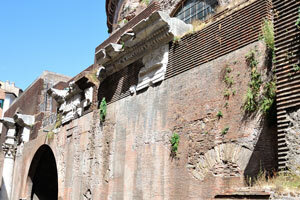 The facade of the Mausoleum of Hadrian. 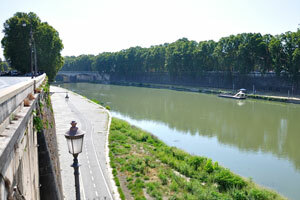 The road is along the Tiber river. 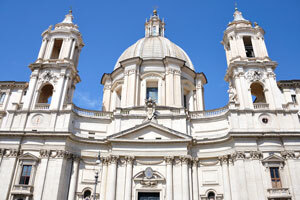 The Papal Basilica of St. Peter in the Vatican as seen from the Mausoleum of Hadrian. 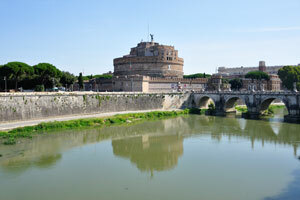 The bridge of Ponte Vittorio Emanuele II as seen from the Mausoleum of Hadrian. 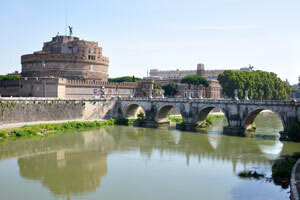 The bridge of Ponte Sant'Angelo was completed in 134 AD by Roman Emperor Hadrian. 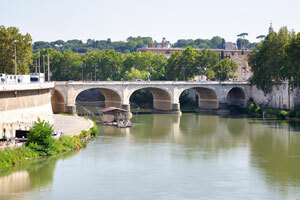 The Tiber is the third-longest river in Italy. 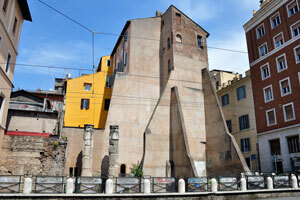 Side view of the Mausoleum of Hadrian. 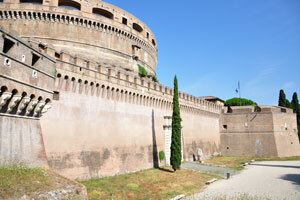 The wall of Castel Sant'Angelo. 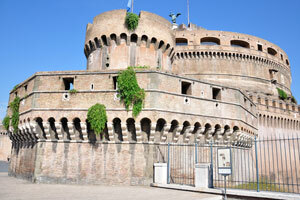 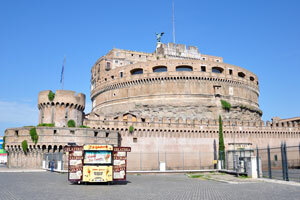 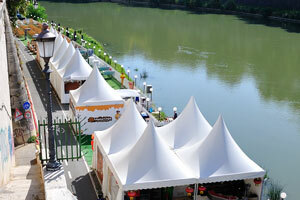 Outdoor ice cream booth is beside the Castel Sant'Angelo. 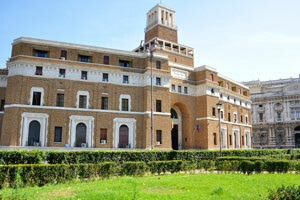 Casa Madre dei Mutilati e Invalidi di Guerra “The palace of War Cripples”. 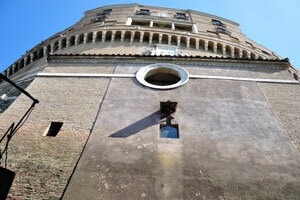 The facade of the palace of War Cripples “Palazzo dei Mutilati e Invalidi di Guerra”. 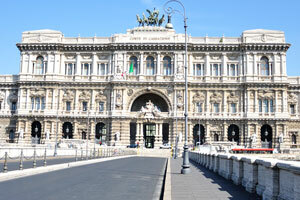 Side view of the Supreme Court of Cassation. 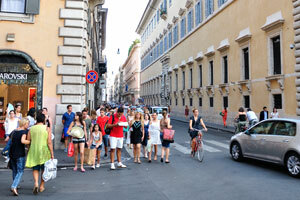 The street of Via Triboniano. 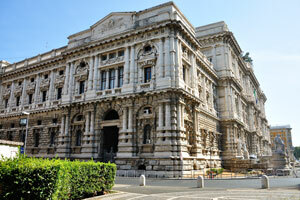 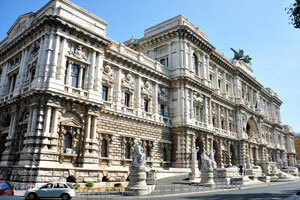 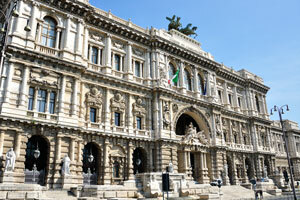 The facade of Supreme Court of Cassation. 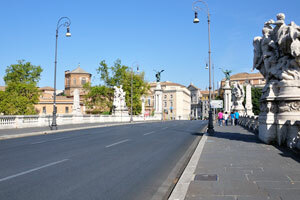 The bridge of Ponte Umberto I. 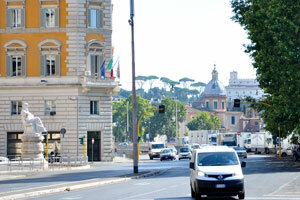 The street of Lungotevere Prati. 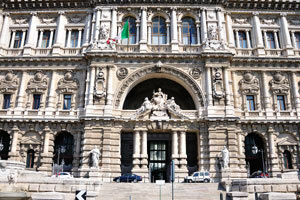 The facade of the Palace of Justice. 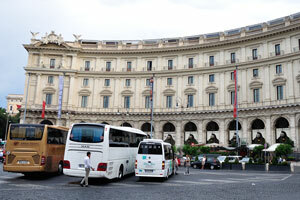 The cafe at the foot of Ponte Umberto I bridge. 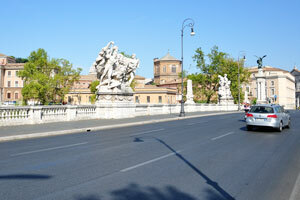 The bridge of Ponte Umberto I was built between 1885 and 1895. 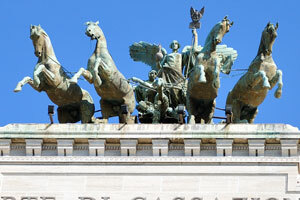 Great bronze quadriga by Ettore Ximenes, 1926. 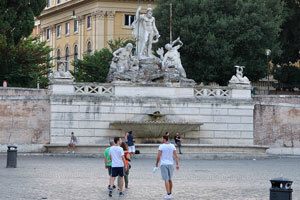 Locals have a good habit to collect poop of their dogs. 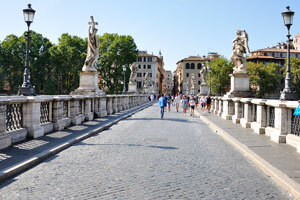 The bridge of Ponte Cavour. 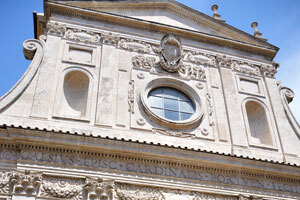 Museum of the Souls of Purgatory. 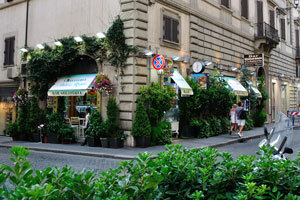 The shop of Andreano is on the square of Piazza di Tor Sanguigna. 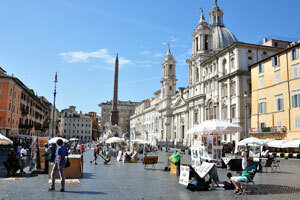 Piazza Navona is a most wonderful place for a tourist to relax after a long day of sight seeing. 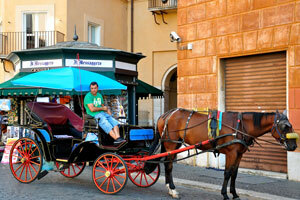 An elegant carriage is on Piazza Navona. 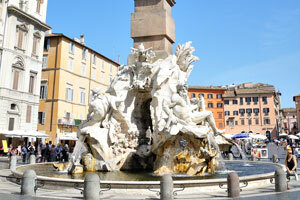 The Fountain of Neptune is located at the north end of Piazza Navona. 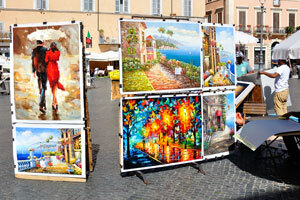 Piazza Navona is full of street artists and colourful paintings. 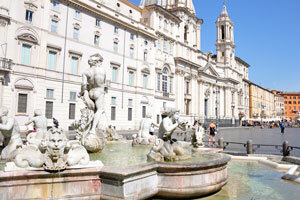 The Fountain of the Four Rivers is located in the center of Piazza Navona. 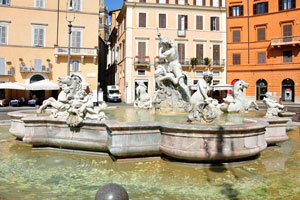 Fontana dei Quattro Fiumi “Fountain of the Four Rivers” was designed in 1651 by Gian Lorenzo Bernini. 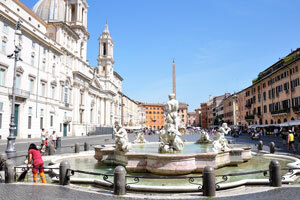 Fountain of the four Rivers with Egyptian obelisk is in the middle of Piazza Navona. 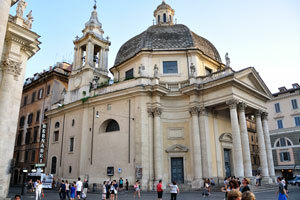 The church of Sant'Agnese in Agone. 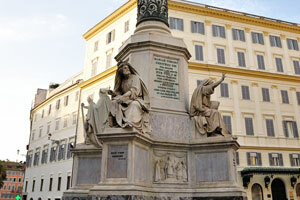 The Moor Fountain is located at the southern end of Piazza Navona. 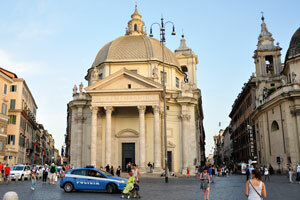 The church of Sant'Agnese in Agone as seen from the Moor Fountain. 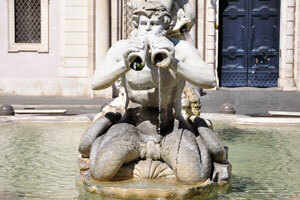 Fontana del Moro “Moor Fountain”. 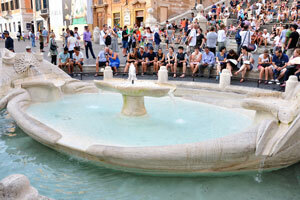 The Fontana del Moro is a fountain which was originally designed by Giacomo della Porta in 1575. 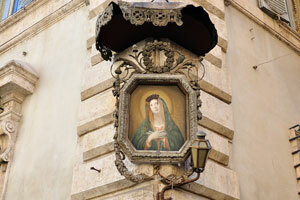 The detailed artwork of the Virgin Mary. 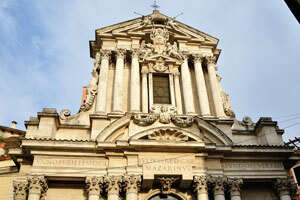 The church of St. Louis of the French is the national church in Rome of France. 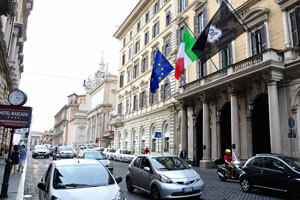 The street of Via della Dogana Vecchia. 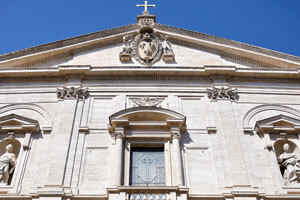 The facade of San Luigi dei Francesi. 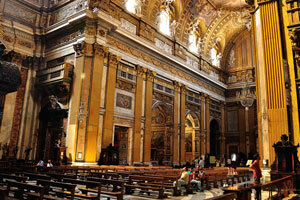 The interior of San Luigi dei Francesi. 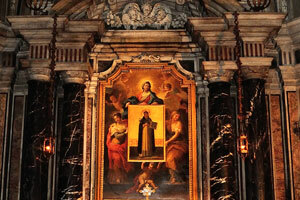 The chapel of St. Louis of the French. 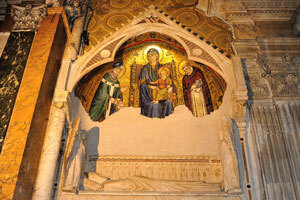 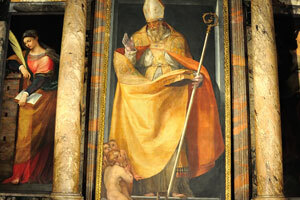 San Luigi dei Francesi is dedicated to the Virgin Mary, to St. Denis the Areopagite and St. Louis IX, king of France. 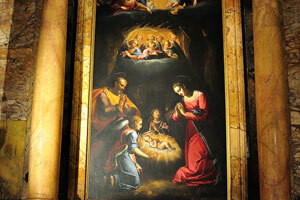 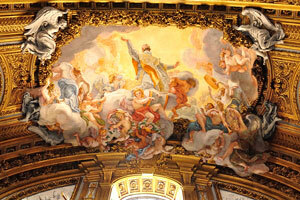 Artists who worked in the decoration of San Luigi dei Francesi. 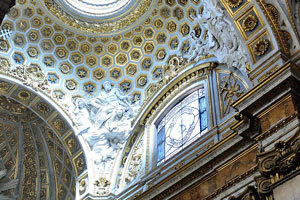 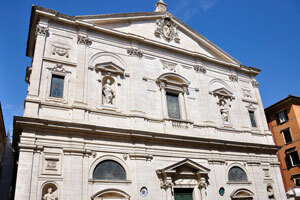 The Church of St. Louis of the French is located not far from Piazza Navona. 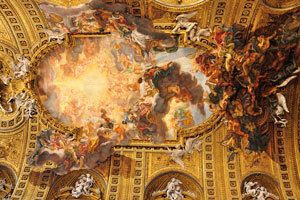 The ceiling of San Luigi dei Francesi. 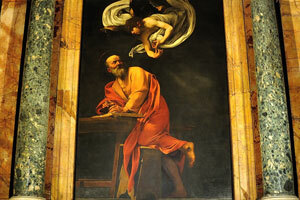 “The Inspiration of Saint Matthew” painted by Caravaggio in 1599-1600. 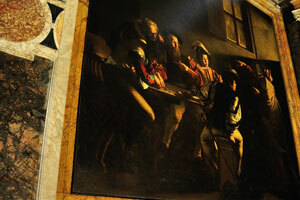 “The Calling of St. Matthew” by the Baroque master Caravaggio. 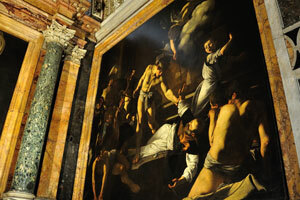 “The Martyrdom of Saint Matthew” by Caravaggio. 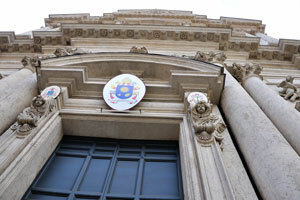 The sculpture of Josepho Francisco is over the entrance door. 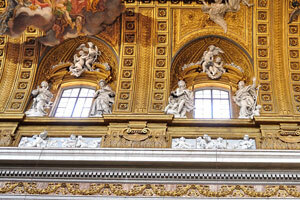 Sculptures of angels are below the ceiling of the church. 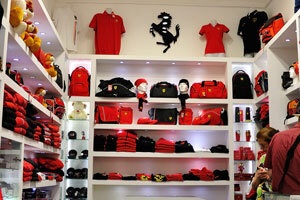 There is the small Ferrari store on the street of Via Giustiniani near the Pantheon. 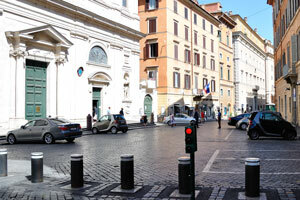 The city square of Piazza della Rotonda. 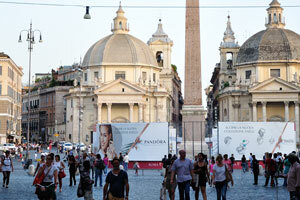 Fontana del Pantheon at Piazza della Rotonda features a six-metre obelisk. 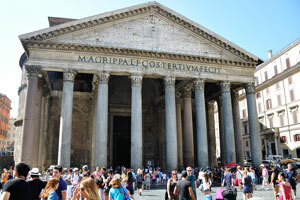 The facade of the Pantheon. 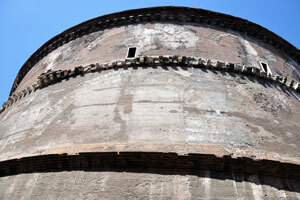 The inner part of the Pantheon's dome. 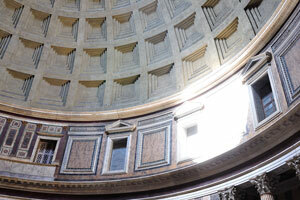 This is the oculus of the Pantheon, оculus is a circular opening at the apex of a dome. 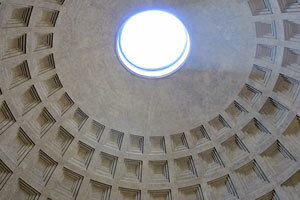 The oculus is the main source of natural light in the Pantheon. 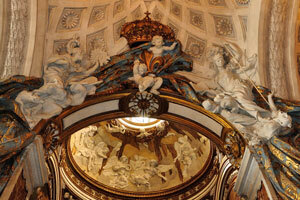 “The Assumption” by Andrea Camassei (1638), Pantheon. 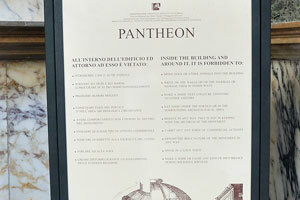 The list of rules and restrictions inside and around the Pantheon. 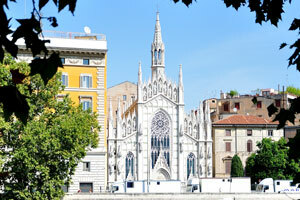 Basilica Santa Maria ad Martyres. 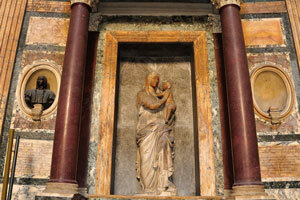 One of the ancient sculptures is in the Pantheon. 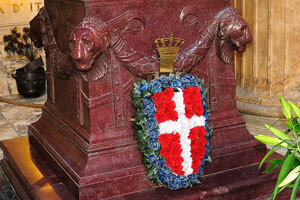 Coat of arms made of flowers is in the Pantheon. 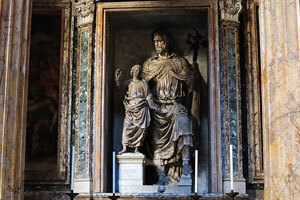 The tomb of Raphael is found in the Pantheon right under this statue. 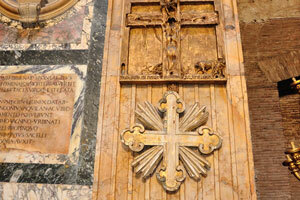 The sculpture of the shining cross is in the Pantheon. 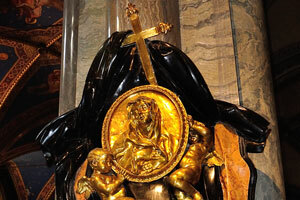 The lampstand of the Pantheon. 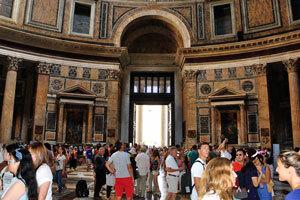 The Pantheon is full of tourists. 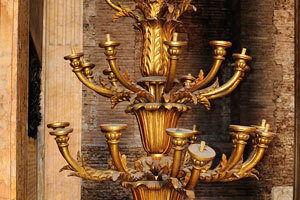 Seven lampstands are in the Pantheon. 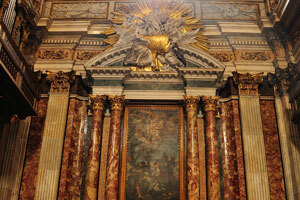 The high altar of the Pantheon. 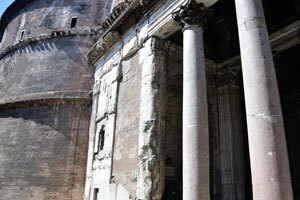 Inner view of the entrance to the Pantheon. 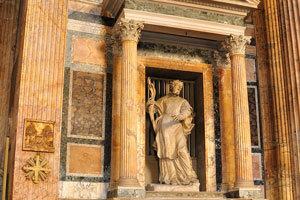 One of the statues of the Pantheon. 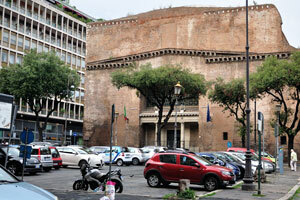 The northeast side view of the Pantheon. 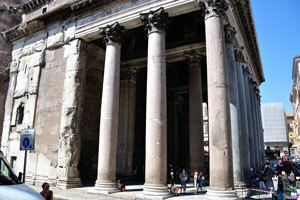 The portico of the Pantheon. 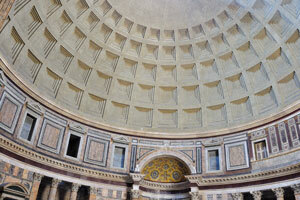 Pantheon holds the record for the world's largest unreinforced concrete dome. 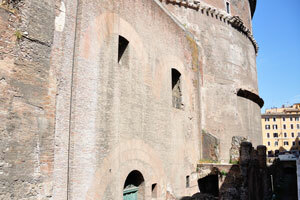 An outer wall of the Pantheon. 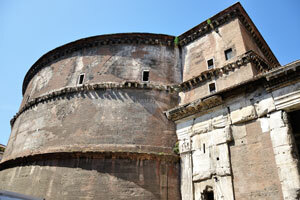 The rear side of the Pantheon. 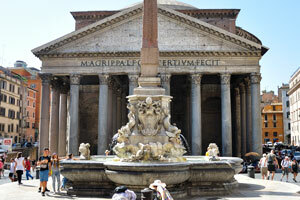 The eastern side of the Pantheon. 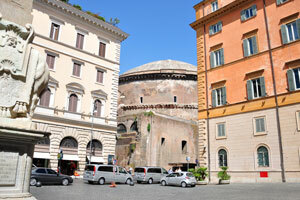 Though the Pantheon often drawn as a free-standing building, there was a building at its rear into which it abutted. 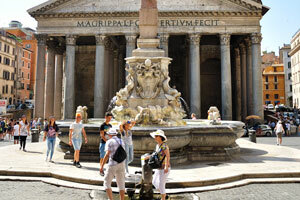 The present building of the Pantheon was completed by the emperor Hadrian and probably dedicated about 126 AD. 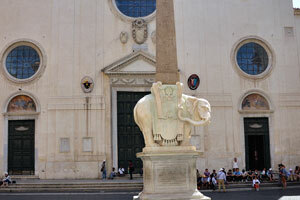 “Elephant and Obelisk” is a sculpture designed by the Italian artist Gian Lorenzo Bernini. 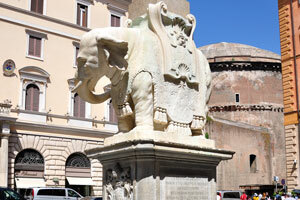 “Elephant and Obelisk” sculpture was unveiled in February 1667 in the Piazza della Minerva. 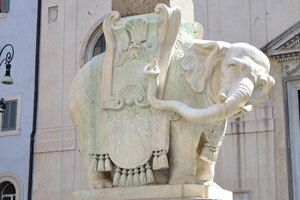 “Elephant and Obelisk” sculpture is situated just outside the church of Santa Maria sopra Minerva. 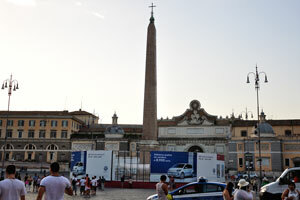 View of the “Elephant and Obelisk” sculpture from the east. 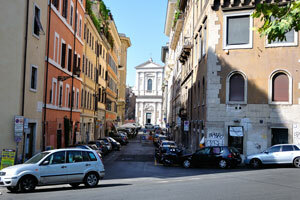 South east view of the Pantheon from Piazza della Minerva, 2015. 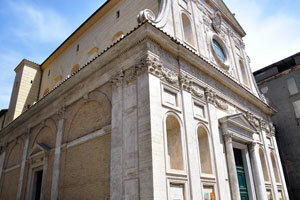 The facade of Santa Maria sopra Minerva was built by Carlo Maderno. 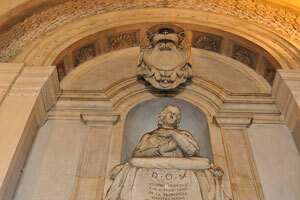 Monument to Carlo Emanuele Vizzani by Domenico Guidi. 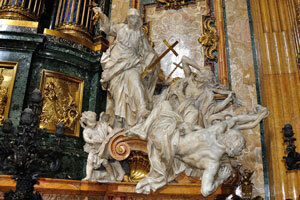 Monument to Alessandro Valtrini, school of Bernini. 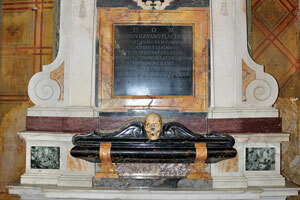 Skulls are in the bottom part of the monument to Alessandro Valtrini. 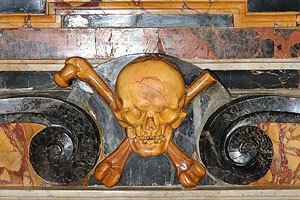 Skull and Crossbones engraved on the surface of the pillar. 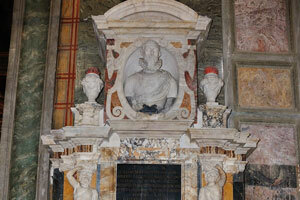 Mosaic is over the tomb of Guillaume Durand the Elder. 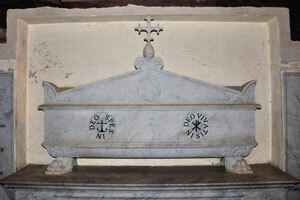 One of the tombs is in the church. 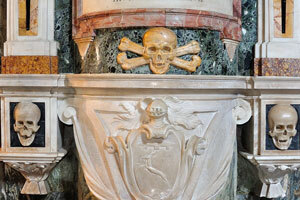 Symbolism of the Skull and Crossbones used everywhere in the church. 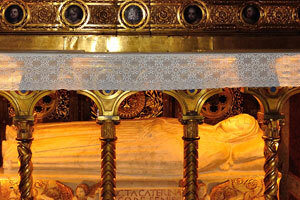 Sarcophagus of Saint Catherine of Siena beneath the High Altar. 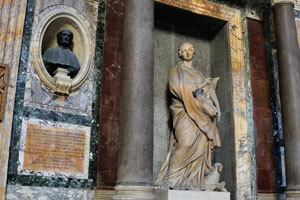 Tomb of Cardinal Domenico Pimentel by Gian Lorenzo Bernini is on the right. 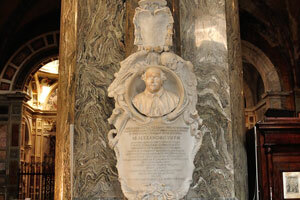 Tomb of Cardinal Domenico Pimentel “1675” by Gian Lorenzo Bernini. 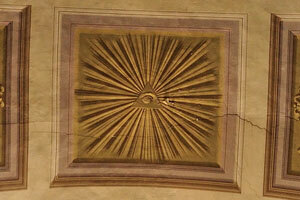 Eye of Providence is on the ceiling. 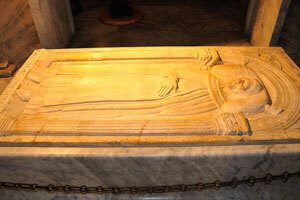 Tomb of Fra Angelico by Isaia da Pisa “1455”. 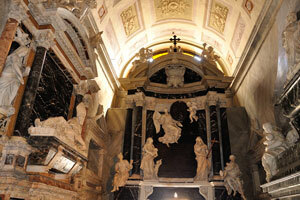 Chapel of Saint Dominic “1725” by architect Filippo Raguzzini of Benevento. 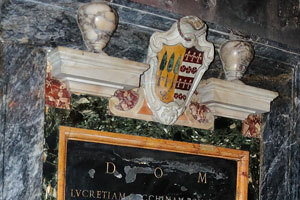 Tomb of Octaviano Baldino (Ottaviano Ubaldino). 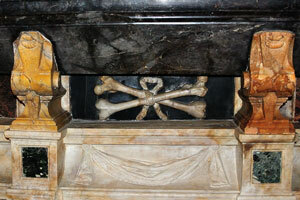 Skull and Crossbones of orange color decorate the dilapidated tomb. 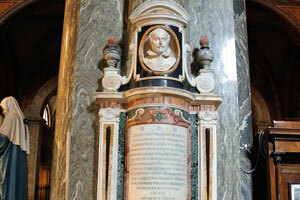 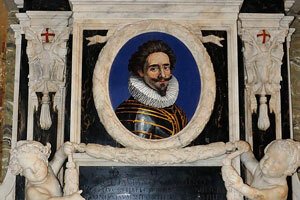 Bust and tomb of Giovanni Vigevano. 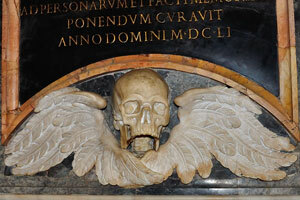 A skull detail of the monument to Fabio and Ippolito de' Amicis designed by Pietro da Cortona. 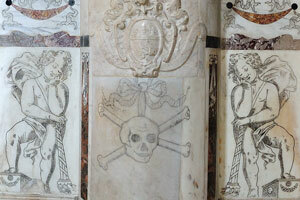 Almost every tomb in this church was decorated with skull and crossbones. 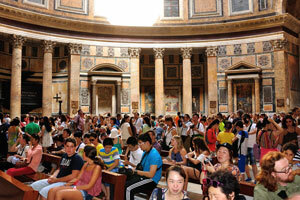 One of the chapels is inside the church. 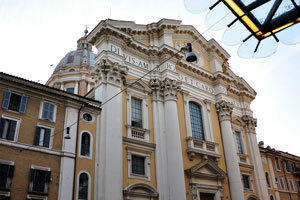 The church of Santa Maria sopra Minerva is located in Piazza della Minerva near the Pantheon. 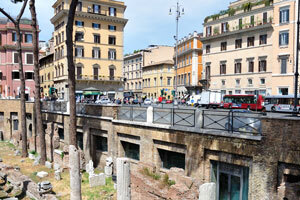 Remains of the Baths of Agrippa are on the street of Via dell'Arco della Ciambella. 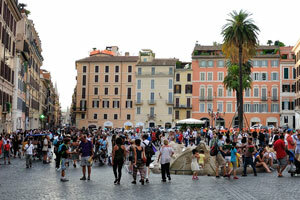 The square of Largo di Torre Argentina. 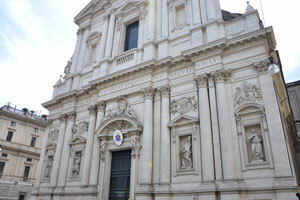 The baroque facade of the church. 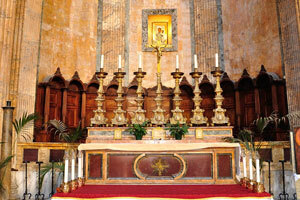 The rich interior of the church. 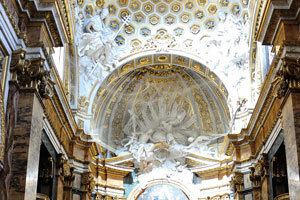 View of the ceiling is in the mirror. 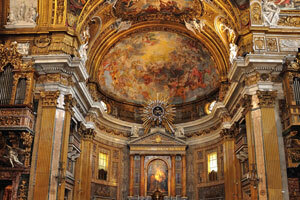 This awesome ceiling of the church is the most impressive in the whole world. 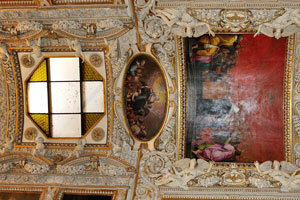 The trompe-l'oeil effect is on the ceiling. 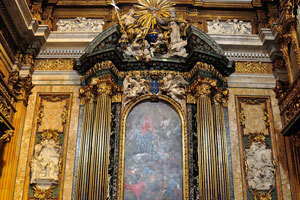 Eye of Providence is depicted on the painting. 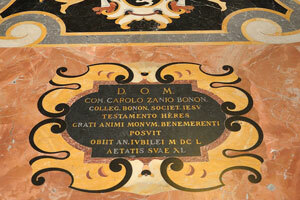 The floor of the church is decorated by polychrome marbles. 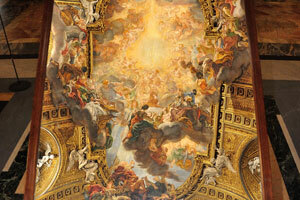 This part of the ceiling is over the church entrance. 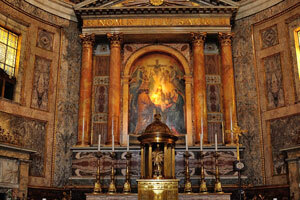 Saint Francis Xavier Chapel was designed by Pietro da Cortona. 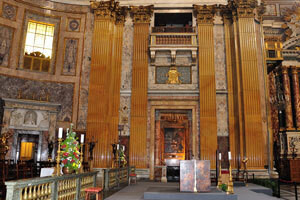 The present high altar was designed by Antonio Sarti “1797-1880”. 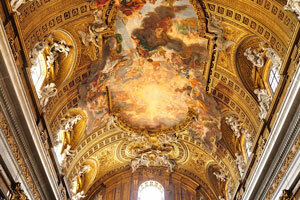 The breathtaking ceiling of the St. Ignatius Chapel. 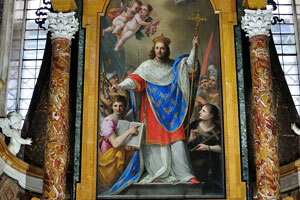 Religion overthrowing Heresy and Hatred by Pierre Le Gros the Younger. 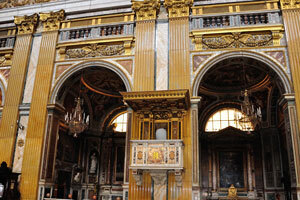 The right side of the nave. 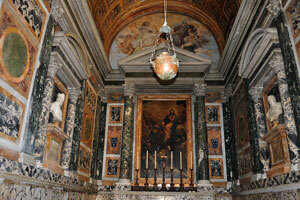 The chapel to the right of the high altar is the chapel of the Sacro Cuore “Holy heart of Jesus”. 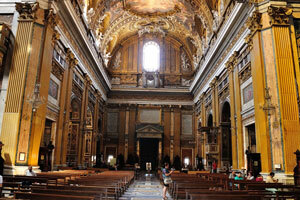 The Church of the Gesu is the mother church of the Society of Jesus (Jesuits), a Catholic religious order. 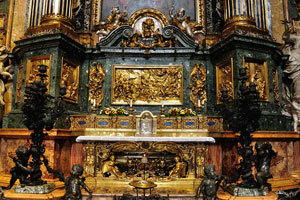 View of the church from the high altar. 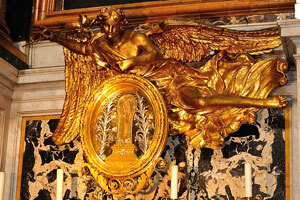 The angels surrounding the IHS aureole were sculpted by Rinaldo Rinaldi “1793-1873”. 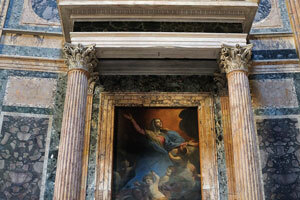 Sacred Heart of Jesus by Pompeo Batoni. 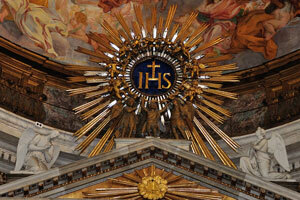 The statuette of a woman holding the IHS sign is in the Saint Francis Xavier Chapel. 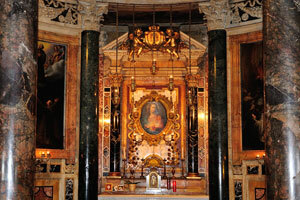 The altar of the Saint Francis Xavier Chapel. 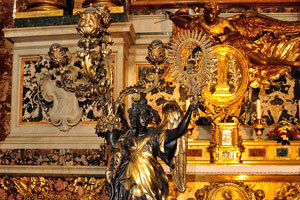 Triumph of Faith over Idolatry by Jean-Baptiste Theodon “1698-1702”. 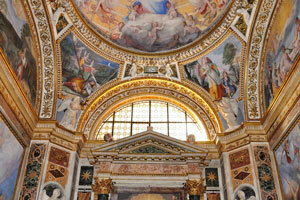 The dome and the ceiling are decorated by the Baciccia frescoes. 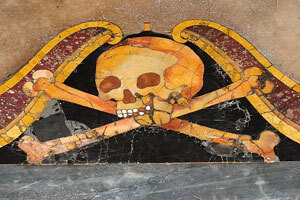 The floor of the church was decorated with Skull and Crossbones which were made of the polychrome marble. 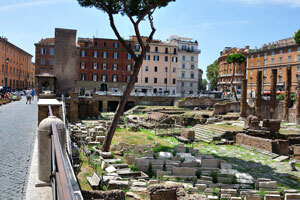 Archaeological area of Largo di Torre Argentina. 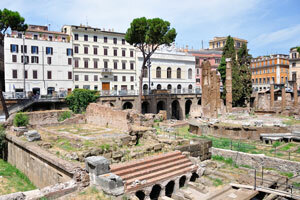 Temple A (to Juturna) is in Largo di Torre Argentina. 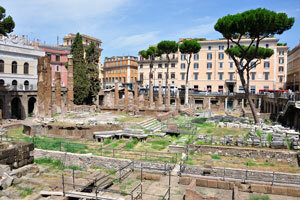 Largo di Torre Argentina is a square that hosts four Republican Roman temples and the remains of Pompey's Theatre. 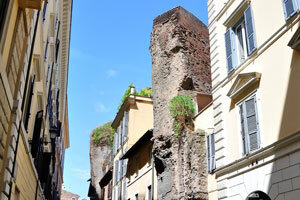 The medieval Torre del Papito is behind the archaeological area of Largo di Torre Argentina. 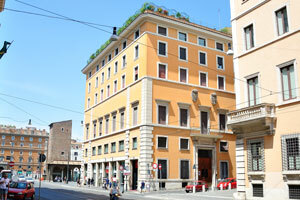 The building of Azienda Tessile Romana. 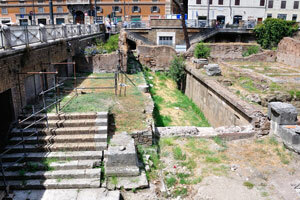 Temple C (on the left) and Temple B (on the right) are in the square of Largo di Torre Argentina. 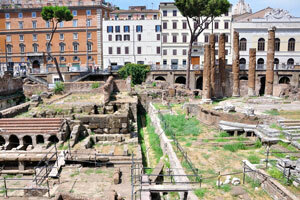 Temple B (on the left) and Temple A (on the center) are in the square of Largo di Torre Argentina. 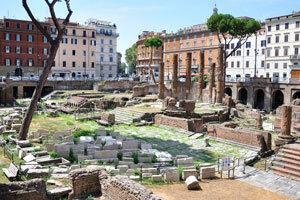 Largo di Torre Argentina is located in the ancient Campus Martius. 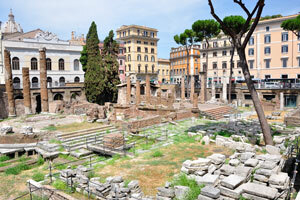 Temple D is the largest of the four temples in the archaeological area of Largo di Torre Argentina. 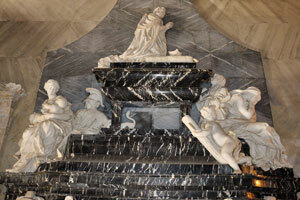 Temple C was probably devoted to Feronia the ancient Italian goddess of fertility. 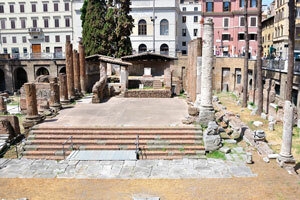 The Teatro Argentina is an opera house and theatre located in Largo di Torre Argentina. 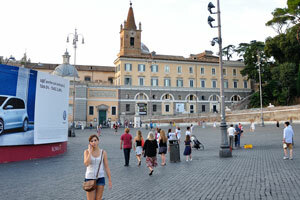 The square of Largo Arenula. 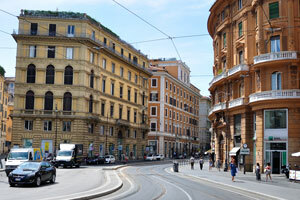 Tramway tracks are on the square of Largo Arenula. 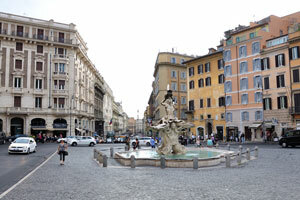 The square of Piazza di Sant'Andrea della Valle. 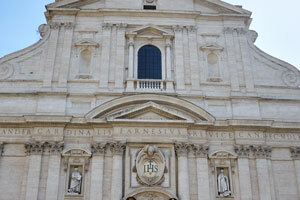 The facade of Sant'Andrea della Valle. 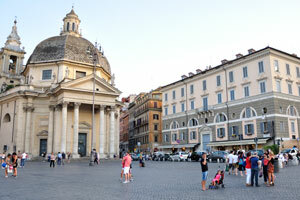 Piazza di Sant'Andrea della Valle. 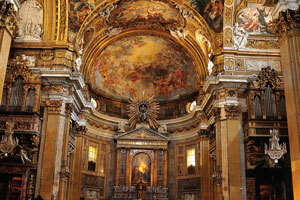 Sant'Andrea della Valle is a basilica church in the rione of S.Eustachio. 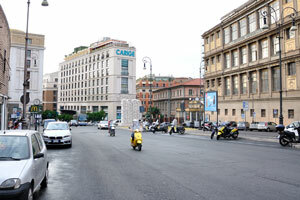 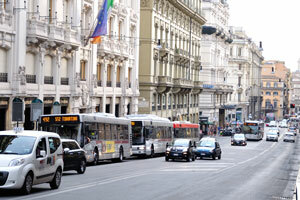 The street of Corso Vittorio Emanuele II. 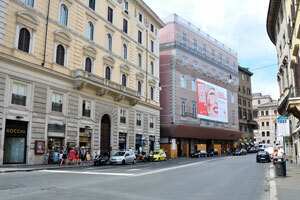 “Space 23” sporting goods store. 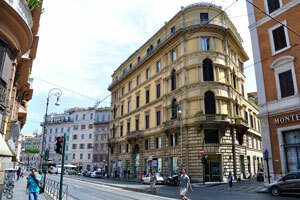 Somewhere close to Campo de' Fiori. 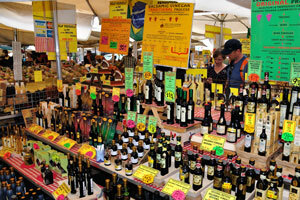 The wine stall in Campo de' Fiori. 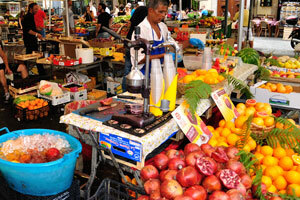 The fruit stall in Campo de' Fiori. 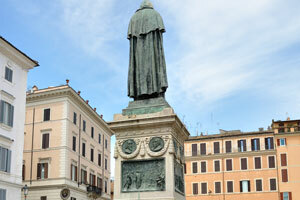 The rear side of the monument to philosopher Giordano Bruno which is situated in Campo de' Fiori. 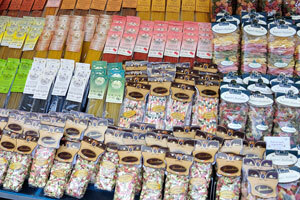 The pasta stall in Campo de' Fiori. 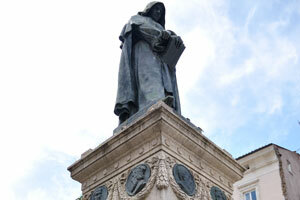 The monument to philosopher Giordano Bruno at the centre of Campo de' Fiori. 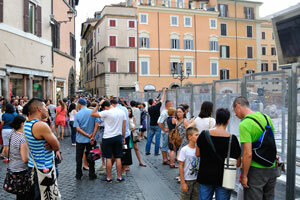 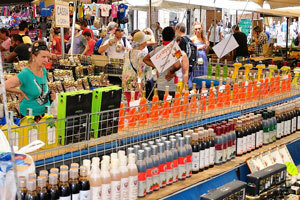 Numerous stalls of Campo de' Fiori. 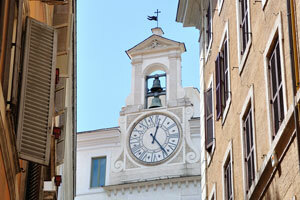 I saw this clock face somewhere on the street of Piazza Benedetto Cairoli. 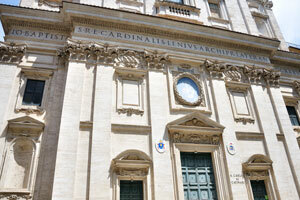 The facade of San Carlo ai Catinari. 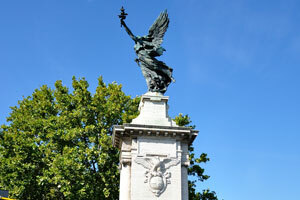 The monument to Frederick Seismit-Doda was built by Eugenio Maccagnani “1906”. 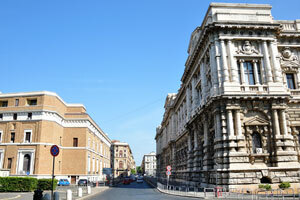 The bank of Imprebanca S.P.A. 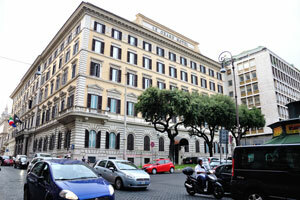 The post office of Poste Italiane Spa. 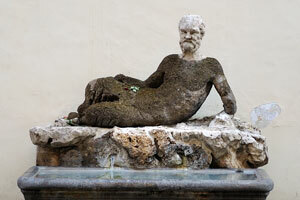 The ephebes, the turtles and the dolphins. 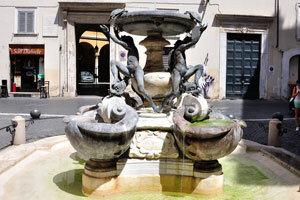 The Fontane delle Tartarughe is a fountain of the late Italian Renaissance, located in Piazza Mattei. 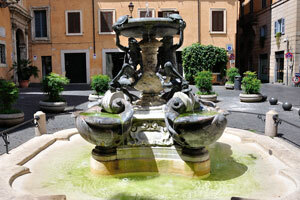 The Turtle Fountain is in Piazza Mattei. 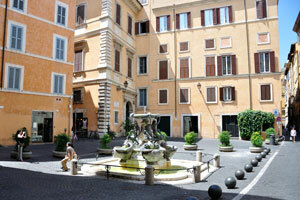 Piazza Mattei and the Fontana delle Tartarughe “The Turtle Fountain”. 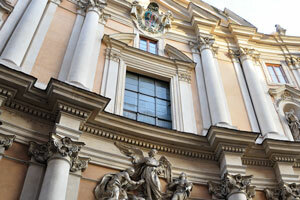 The church of Santa Caterina dei Funari. 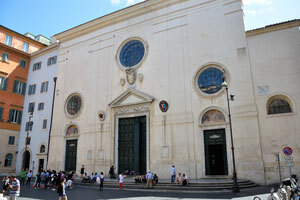 The facade of Santa Caterina dei Funari. 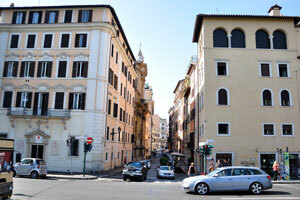 The street of Via delle Botteghe Oscure. 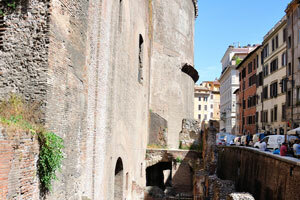 The Temple of the Nymphs is on the street of Via delle Botteghe Oscure.